When removing my old wood I found a mastic/tar substance between the wood and metal. Is this original? Is it necessary? i think i was told it was dum dum. kind of a crude RTV/weather sealer of its time. Im betting there is a more modern better sealer people use but dont know what it is. Fit all the wood first. I used roofing tar on the final installation and cleaned up excess. Everything must be clean for painting. For the 82-A closed cab, the rear roof rail is most important since water can run inward due to the upward flange of the rear panels. 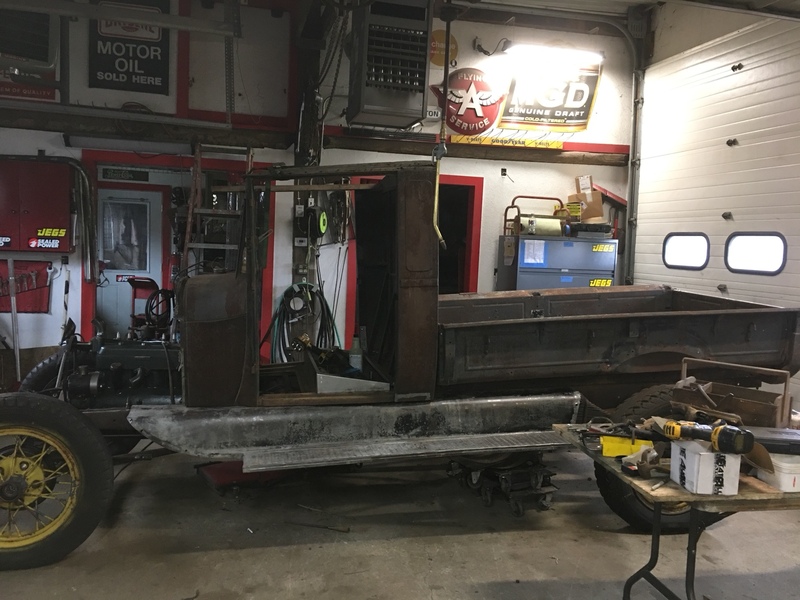 Put cab on today- will be removing old wood and installing new wood with roofing cement this week. All rust but mostly solid. Been cleaning gas tank today. Removed it and scraped some rust loose from bottom. Vacuumed and poured in 35 1/2 nuts. I have been rolling and sloshing all day. Do it for a couple of minutes then rest while doing something else. Cleaning up pretty good. Will continue till tomorrow afternoon and then seal it.